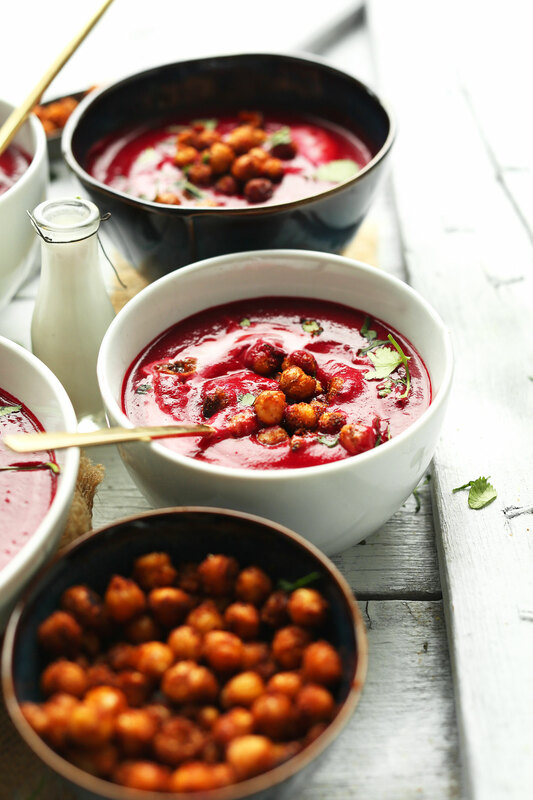 The obsession lives on, and I have another treat for you guys: A 30-minute curried beet soup with crispy tandoori-roasted chickpeas. You in? There’s an Indian restaurant in Portland called Bollywood Theater that’s quite sensational. They serve a roasted beet dish cooked in coconut milk and curry leaves. Mmm. So many people had raved about them I had to try them myself. The bad news: While the flavor and concept was there, the texture wasn’t what I was hoping for. The good news: I made my very own inspired version at home and turned it into soup. Spoiler alert: Mine (in my opinion) is better than the original concept (just sayin’). This soup is simple, requiring just 30 minutes from start to finish. It’s also vegan, gluten free, and loaded with health benefits. 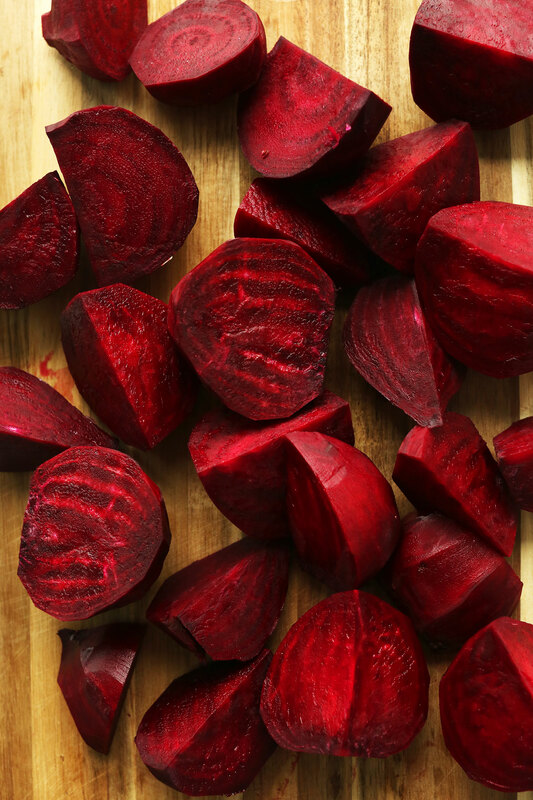 Beets are rich in iron, fiber, folate, vitamin C, and potassium. They’re also a natural anti-inflammatory, are loaded with disease-fighting phytonutrients, and help the body detoxify. Coconut milk not only provides a creamy base to this soup, it also boasts healthy doses of B vitamins and vitamin C, as well as iron, selenium, and calcium. Ginger is a natural anti-inflammatory and pain reducer. It’s also proven to help settle an upset stomach and also improves digestive function. Also, delicious. Garlic also acts as an anti-inflammatory in the body, and is a great source of vitamin C, B6, manganese, and selenium. Somehow, it also contains compounds that help regulate our blood pressure. I know, it’s magic. While your soup is cooking, roast your chickpeas. I toss mine in a simple mixture of salt, coconut sugar, and my go-to tandoori masala spice blend, which you can find at spice markets and grocery stores like Whole Foods. The result is a tender chickpea with a slightly crispy edge and a rich, smoky, subtly spicy flavor – perfect for topping this soup. If you have an abundance of beets in your pantry, this is the recipe for you. This soup is perfect for when you’re craving something a little spicy, warm, and comforting. 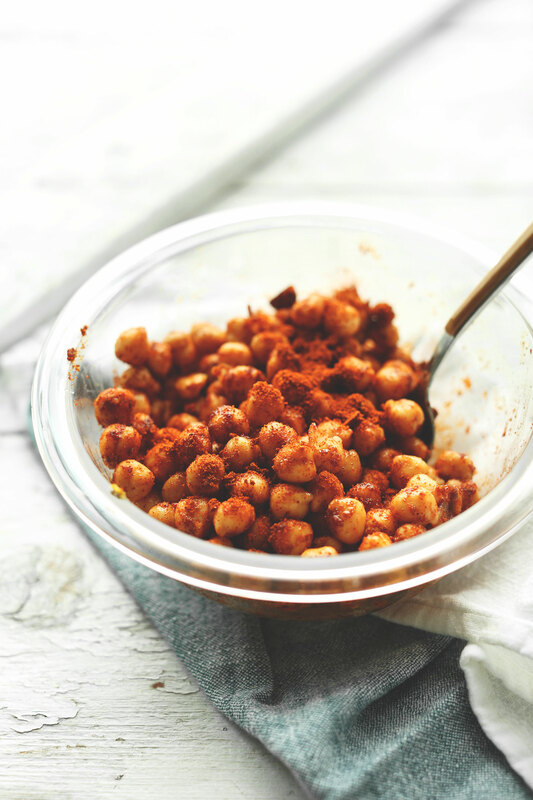 The crispy, tandoori chickpeas make it a complete meal with one small serving providing almost 11 grams of protein and 7 grams of fiber. If you try this recipe, let us know! Leave a comment, rate it, and tag a picture #minimalistbaker on Instagram so we can see what you came up with. Cheers, friends! 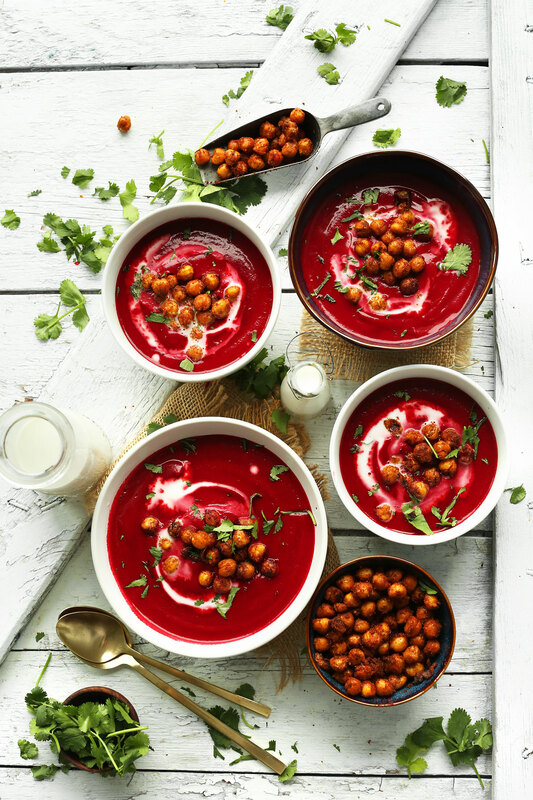 Creamy, 30-minute curried beet soup with coconut milk, curry spices, and tandoori-roasted chickpeas! A hearty and healthy winter soup. If preparing chickpeas, preheat oven to 375 degrees F (190 C), and add rinsed and dried chickpeas to a small mixing bowl. Top with coconut oil, salt, tandoori masala, and coconut sugar. Toss to combine, and sample a chickpea. Taste and adjust seasonings as needed. Spread onto a bare baking sheet and bake for 20-25 minutes, or until deep golden brown and fragrant. Set aside to cool. In the meantime, heat a large pot over medium heat. Once hot, add oil, shallots, garlic and ginger. Sauté for 2 minutes, stirring frequently. Add beets, salt and pepper, curry paste, cinnamon, turmeric, cumin, cayenne, cardamom and coriander (optional). Stir to coat, then cover and cook for 4 minutes, stirring occasionally. Add coconut milk, vegetable broth, and coconut sugar. Bring to a low boil over medium heat and then reduce heat to low, cover, and simmer for 15 minutes, or until beets are fork tender. Taste and adjust seasonings as needed, adding more dry spices, salt, or sweetener to taste. I didn't make any adjustments. Serve with an extra drizzle of coconut milk (optional), a generous amount of tandoori chickpea, and a sprinkle of cilantro (optional). Store leftover soup covered in the refrigerator for 3-4 days or in the freezer up to 1 month. Store chickpeas separately in a well-sealed container at room temperature up to 2 days. * I bought my Tandoori Masala Spice blend at Whole Foods (it's the Whole Foods Market brand), but you can easily make your own (next note). *DIY Tandoori Masala Blend: 3 Tbsp ground cumin, 2 Tbsp garlic powder, 2 Tbsp ground paprika, 3 tsp ground ginger, 2 tsp ground coriander, 2 tsp ground cardamom. Multiply as needed. *Recipe adapted from my Curried Butternut Squash Soup. *Nutrition information is a rough estimate calculated. Loved the recipe! Only made the soup but it was so flavorful, easy and creamy! My pinterest is full of your recipes! Thnx! Really good soup! I have never had a beet in my life and this recipe looked amazing. So glad I tried it. I have digestion issues and puréed soups work best but can sometimes be bland wand boring. This soup was so flavorful!!! I’ll certainly make it again. Thanks for the lovely review, Shanon! Peeling the beets is best for a creamy texture. We updated the recipe to specify peeling- thanks for letting us know! This was absolutely delicious! I am a huge fan of Minimalist Baker—every recipe on your blog is always a home run with vegans, vegetarians, and omnivores alike. Served this with some crunchy seedy bread and goat cheese. Unbelievable combination. Thank you for sharing! Yay! We are so glad to hear that, Andrea! Made it today. V gingery, very pink, delicious! Skipped the coconut milk but added a dollop of sour cream when serving. Thanks! I made this today with fresh garden beets. It’s definitely…earthy. I like it, but I’m not in love with it. The chickpeas are lovely (had to make the DIY tandoori blend) and mine wasn’t as thick as yours (wanted to take a lovely photo but my chickpeas sank to the bottom haha!) 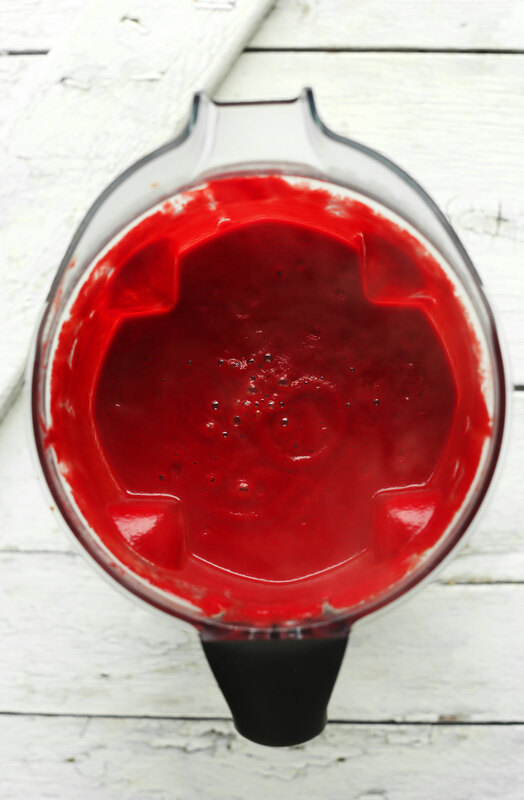 I may make this again, just for the healthy beet properties alone and the colour is really nice. I have to admit – not a chickpea fan, but I gave it a shot anyway. This is the first time I’ve enjoyed them in a recipe!! Thanks for sharing! I made the soup and it was wonderful. We loved it . Thank you. Was the approximate 80g per beet for cooked beets? I bought two largish beets that were a total of 660g, doesn’t seem like enough. I so agree! My first time on this website and I didn’t go slowly and carefully enough in reading the recipe. Luckily I am not on instagram. I have been cooking for 50 years from the web and from some of the finest chefs books. This has never happened to me. This soup is amazing. Made it last weekend and served myself the first cup straight out of the Vitamix (did not even wait for the chickpeas to get done). Even DH who generally is not a big fan of pureed soups really liked it – I mean, how can one possibly resist bright magenta food?!? Thank you for keeping us supplied with nutritious, delicious, and never boring vegan meals! P.S. Congrats on winning the Blog category in the 2017 VegNews Veggie Awards – you rock!!! the recipe looks really delicious and I appreciate the nutritional information. I was surprised by the high sodium- 1400 mg in a serving seems really steep. Is that correct? I think I will try with Himalayan pink salt with is less salt-y and more mineral-y and also use less, but I can’t figure out where that number comes from.. I made this one tonight although minus the chickpeas since was searching for something to eat for dinner after my wisdom tooth removals. But dang girl that recipe is bomb it tasted SO good ! I didn’t had any green curry paste so I substituted it with 2 tbsp of yellow powder curry and it still turned out to be amazing. I also didn’t add the sugar since I’m on a sugar free kinda thing but it tasted sweet enough to my personal taste even without sugar since beets are naturally on the sweet side. Thanks Dana, I made this soup tonight and it was delicious!! Just wondering, I did add some lime to the soup, probably out of habit. Did you let any lime/lemon juice out of this recipe on purpose? Love this! Made it tonight for supper (had a bunch of freshly dug up beets from the garden) and both hubby and I were very pleasantly surprised by the total deliciousness of this soup! Thank you Dana! I served my soup with lime wedges and it was a big hit! Picture perfect looking soup with a flavorful punch. This is probably the best soup I have ever made! Thank you so much for sharing this recipe.. This goes into my keepers binder. I will make this again very soon! I think this recipe could lose all the added coconut sugar. The natural sweetness of the beetroot is more than enough, if i had added any sugar it would have been in the ballpark of a (very sweet) dessert! Completely unnecessary in my opinion. Thanks so much for the recipe! I made it last night and I think it’s legendary – and I’m not usually impressed by my own cooking. I wanted to leave a comment because I modified the recipe a little bit. About a year ago, our neighbor brought us some beet soup with noodles (elbow pasta). Both me and my husband loved it – I felt like I haven’t eaten anything so hearty and delicious before. Knowing that his recipe had cream and chicken stock in it, I looked for a healthier version of it. When I made this recipe last night, I was very light on the spices that are unique to the Indian cuisine but I was generous on the ginger and black pepper. I used an unsweetened coconut milk and added no extra sugar. I skipped the chick peas and added elbow pasta in it (not better or worse – I was just eager to match my first experience with this delicious soup). Until I blended the beets it was so very coconut-y (of course), but the coconut flavor was so mild at the end. I must say, I cooked the beets an additional 10 minutes (total of 25 mins) but I still had trouble blending it with a hand blender. I ended up separating the beets and blending them in a small robot. I’m not sure what went wrong there. Overall – thank you so much for the recipe. I love it so much. Delicious! 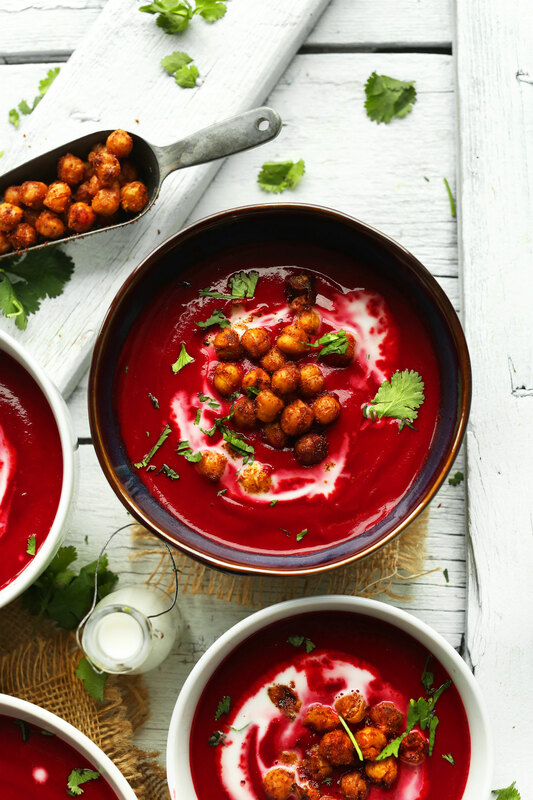 I’ve been wanting to make a beet soup for a long time and this recipe sounded like a total win. I had already roasted my beets in the oven, so I just added them at the blending stage. I followed the DIY note for the tandoori masala spice blend and the chickpeas turned out delicious. The soup was spicier than I thought it was going to be (just realized I didn’t add coconut sugar or maple syrup). Much too spicy for my two year old, but I mixed some up with his favorite vanilla greek yogurt and he LOVED it. My husband gobbled it up at full spiciness, but I added greek yogurt and more coconut milk to mine. Thanks for the recipe. Holy cow! I just made this (am eating my second bowl right now) and its AMAZING! The soup is the perfect combo of spicy and sweet and the chickpeas taste like falafels. My carnivorous gluten-loving boyfriend who wasn’t hungry when I made the soup has already eaten two bowls and given me an embarrassing number of high fives. This soup is phenomenal! I only blended half because I like some chunkiness. The crispy roasted chickpeas are so good! Hi! I’d definitely recommend coconut milk for this one! I made this soup and this is truly the best soup i ever had! Thank you so much! I adore this recipe! I managed to eat nearly half of it one sitting. It just feels so wholesome and warming! The smell and the colour are beautiful too. Takes minimal time to prepare which is my favourite kind of dish when I lead a busy life! This recipe is the perfect amount of warmth/heat and comfort. I adjusted the recipe slightly and exchanged green curry paste for curry powder and committed the coconut sugar because I’m trying to cut sugar. Instead of garnishing with chickpeas like called for, I cubed some sweet potatoes, roasted them, and added some to the bottom of each bowl. The recipe freezes well! Could you substitute red curry paste for the green curry paste? I used red curry paste because I didn’t have green, and it was still delicious :-) I also used about half the amount of maple syrup because I wanted more savory than sweet (and the beets offer their own nice flavor). I used packaged beets rather than raw (just because that’s what I had) so I needed less cooking time, and I left some beet chunks whole for some variety. I also used cannellini/white beans because I didn’t have chickpeas on hand. The cannellinis were less crispy than I imagine the chickpeas would be, but still very tasty. When I warm up the leftover soup tomorrow, I’ll add some steamed potato chunks (thanks to the reader who commented this about the sweet potatoes!) Delicious! Thanks for the recipe. This soup is so tasty, I was surprised how much I loved it since I’m not a huge beets fan. I used golden beets from the farmer’s market and added a few carrots since I only had 4 beets. I also used full fat coconut milk :) So good, thank you! Absolutely loved this combination! I did substitute chicken broth for veggie since I was out but a super tasty soup. Fantastic for a cold night! this is going on my list of favorites since I always have beets in the house. Happy New Year Dana! Beautiful texture and color and delicious, but next time, I will add half the ginger and half the cayenne. Thanks for the recipe! I have been looking for beet recipes. Why? Beets are the most prolific and long lasting crop in my garden. So easy to grow here(northern Colorado, 5000 ft elevation). Last year I planted two 30′ rows, way way too many, most went to the county food bank. This year just one row, 1/3 to the food bank,1/3 eaten and still have the remainder in garden under a heavy plastic and leave pile.They should last us thru the winter. Keep those recipes coming, going to try this one tomorrow. I love so many of the recipes on this blog, so my husband and I were excited to try this recipe when our weekly farmshare arrived with 6 enormous beets. We were surprised that neither of us cared for it! The flavors didn’t blend well– the sweetness of the beets and the savory flavor of the curry just didn’t work for us. We both agreed, though, that the chickpeas were delicious. We have tried the Curried Butternut Squash Soup (the recipe from which the curried beet soup was adapted) and loved it, so we will stick with that recipe next time! Sorry Julie! These flavors may not be for everybody. Very Easy to make & very delicious & full of flavor! I make this recipe on a regular weekly basis. It is requested often. Guests are impressed. As we know the main ingredient is beets~But i switch it up every time using either zuccini or sweet potato instead of the beets & its always amazing as ever making it a little different. Sometimes I serve it on top of quinoa or fish or chicken or add hemp seeds. This recipe is incredible. We’ve made it 3-4 times now and it’s currently on the stove. No changes made – but, prepare for about 1.5 hours from starting prep to dinner on the table. Prep takes about 30-40 minutes to chop and measure everything, unless you start with premeasured and prechopped. Then, each time we’ve made it, it’s taken 45 minutes for the beets to reach fork tenderness. It’s delicious, and this hasn’t stopped us from making it a million times, just be warned. We usually start around 4:30 and it’s on the table a bit after 6. One question however, how does the recipe change if I use fresh chickpeas? I refer to dried chickpeas that you have to let soak in water over night and cook usually before you can eat them. Have you/has anyone ever tried this awesome recipe with fresh chickpeas? Just made this ready for tonights dinner and I’m finding it hard to stop helping myself to spoonfuls! To say “its like there is a party in my mouth and everybody is invited” is the understatement of the century! This was delicious! Very easy, and time friendly. I used my Nutri-Bullet for blending, and it worked great. The chickpeas were wicked. This soup is everything I crave. I didn’t do the tandoori chickpeas, and instead I made a warm lentil salad. But I definitely think I’ll try them next time! This looks amazing! I can’t wait…those roasted chickpeas must be awesome. Isn’t green curry paste thai though? It also has completely different flavors than curry powder…Also, I’ll probably add curry leaves; just recently finally found a source for them, and they’re sooo good. Highly recommend using them if you can find them. A friend told me about your website. Am making this today with beets from the garden. Am cooking from what I have in the house so have used red onion instead of shallots, almond milk instead of coconut, red paste instead of green, tikka powder instead of tandoori but it smells great. Roll on lunchtime! I’m gonna try this tomorrow! OMG! This color is so impressive! It took me about an hour start to finish, mainly because my beets took a LONG time to get soft enough to puree. I used fresh small beets. I think in the future, I will roast my beets in the oven first (easiest way is to wrap a beet in foil, bake in oven for 45-60 min depending on size, then remove, let cool, and peel). But everything else – amazing!! Great concept, great website, great recipes! Had a ton of beets and made this on a whim tonight. So glad I did- I love the flavors and the crunchy texture of the chickpeas! This is literally one of the best things I’ve ever tasted. You are the goddess of chickpeas. Bravo, again!! Everything I’ve made from your blog has been delicious with no adjustments unless we have to because we’re missing an ingredient. Hi Dana, making this now. Can I use garam masala instead of tandoori? Is there something I should add to it? otherwise will just use the diy spice blend. Also do you peel the beets? and lastly if I don’t have shallots can I use onion? would white or red be preferable? Looks great, but I’m on a low sodium diet and 1400 mgs is really high for a single dish! Is that all coming from the chicken broth and spice mix? MMMM!!! I made this last night and am currently having leftovers for lunch. It’s even better the next day! I will say that it took me closer to an hour to make it though being that I’m fairly new to cooking. I loved it! Smooth as silk… and made my nose run it was so refreshingly spicy. I actually have roasted the chickpeas twice by themselves as a snack. I think it’s my new favorite flavor for roasting chickpeas to crispy goodness. Hello Dana, this soup was delicious! I did not use the curry paste because our little daughter does not like spicy food I used a bit of curry powder insetad as you suggested and it was unbelievable! I am going to make this again for sure! I also followed your recipe for the masala and it worked perfect! Thank you so much! I made this soup over the weekend and It’s fantastic. The chick peas make this dish sing! I’m so happy I found your site. Tried this yesterday – so yummy! Love the colour. Added a bit too much green curry paste but nothing that an extra drizzle coconut milk wouldn’t fix! GIRL. I LIVE for Indian food. Curry, tandoori, tikka masala, saag, bharta, bring it on! Loved this soup & the chick peas gave it the right amount of texture. I only used 1 TSP of coconut sugar in the soup & I had red curry paste instead of green on hand. Does this freeze well? Any way to prep and freeze the chickpeas in advance? I did freeze the soup and chickpeas (separately) and it worked very well! The only thing is that you have to eat the soup within a few weeks, otherwise the color become less vivid. This recipe is on point! Thanks! Dana! made the soup and it’s AMAZING! Starting it, wasn’t too sure about mixing ginger and the rest of spices and how it’s going to blend together. But at the end its the most delicious beet soup I’ve ever had. Thank you for making all those goodies! Thank you for this great recipe. It was the best soup I’ve had in a long time. The colour and creaminess was to die for. 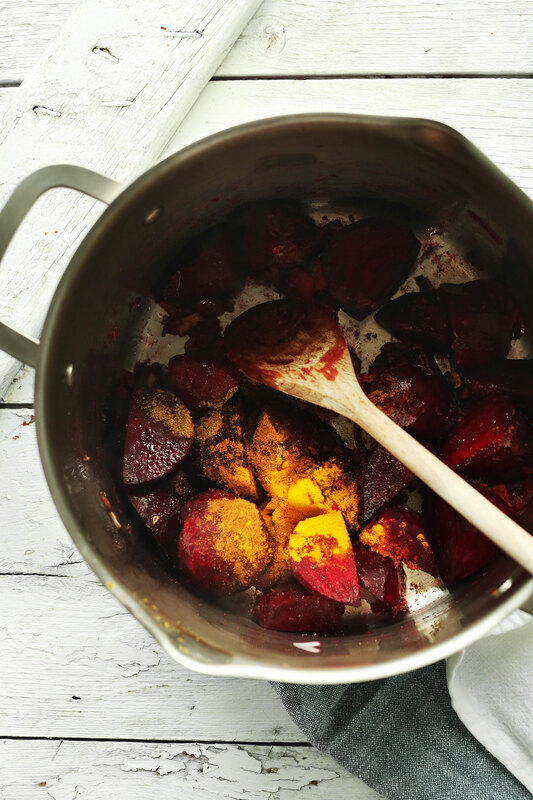 Did you roast the beets first or did you use them raw? Wanted to come back an add that I made the soup last night. I roasted the beets first. Also, I used homemade garam masala (already had it on hand and didn’t want to make up anything else) as opposed to the tandoori masala. What a beautiful and yummy soup. Will definitely make this again. I just stumbled on your site. Oh my gosh! your food is gorgeous. Can’t wait to make this Soup. I copied this exact recipe last night and turned out great but I kept the soup chunky which is just how I like it. I also enjoy eating soup with homemade bread or vegetable potato chips – I paired this dish with roasted zucchini chips coated in Parmesan and black pepper and kale chips. So comforting! I made this last night with a few modifications–it was SO good! I didn’t have enough beets so used just three medium beets + one medium sweet potato. Used a bit less sugar, ground ginger in place of fresh, and only ~3/4 can of light coconut milk. I also didn’t puree it all the way and loved the slightly chunky texture. Can’t wait to eat the leftovers for lunch. Thanks, Dana! This was delicious! I topped with vegan cashew sour cream and tortilla chips for extra crunch, truly superb! I will definitely be making this again. This is delicious! We added a bit of nonfat greek yogurt for serving, instead of extra coconut milk, and it turned out great. Would it be best to roast the beets in the oven first before peeling them? I think I’m going to try that. This looks amazing! What a great mix of flavours. May have to conquer my fear of the Beet Stain. I’m definitely in! I love anything beets and your pictures are stunning! The color of beets really does add something special, doesn’t it? This sounds positively amazing – can’t wait to give this a try! Oh my gosh, the color is so attractive. Stunning color!! SO wish I had beets here in China so I could make this! I just bought a giant bag of beets at Costco last weekend. Now I know exactly what to do with them! Thanks for the recipe, Dana! It sounds wonderful! Anything with beets and I’m in! Those chickpeas – OMG. Need to get some tandoori spice! Sounds like something I could really get into. This looks great! I’m a fan of beet soups in general (I love a good bowl of borsht). I’ll have to give this recipe a try! OHMYGOSH, the colour, the flavours! This looks perfect! I’ve never had beet soup before! This sounds so good! Hi Stephanie! If you’re looking to spend less than $200, I’d recommend this one from Kitchen Aid, which I used before upgrading. A warning though, make sure the container is properly on the platform or it can damage the gears (a lesson I learned the hard way). For these reasons, and wanting more power, I upgraded to a Vitamix last year. And recently I’ve tried a Blendtec, which I prefer based on what you get for the money! If you’re curious about any of our other appliances, find them in our new shop! I can vouch for the Kitchen Aid recommended. We have the same blender, going strong for ~2 1/2 years, works great for soups and smoothies. It is getting slower though, so I may be upgrading in the future. Also – can’t wait to try this recipe! Thanks! It may be worth the investment. We use our blender at least once per day. This looks drool worthy!!! 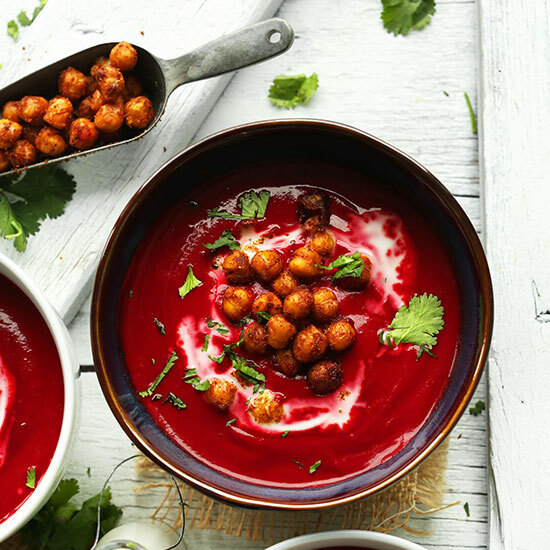 I love all of your recipes, and since I love beets and chickpeas – I’d really love to try this. But I must admit, I don’t like coconut milk when it’s mixed with savory things. I’ve tried countless recipes with coconut milk because I really WANT to like it – but I just don’t. I don’t mind coconut oil or coconut sugar (in fact, I love them both), but something about the richness of coconut milk makes me queasy. So do you think substituting vegetable broth or a different kind of plant milk would be okay? I already have a feeling the answer is no… but I’m trying anyway! Of course! What about rice or almond milk, or just vegetable broth? Good luck! Ooh, looks yammie! :) Have to try!